The AIA Guide to New York, 5th edition, 2010, by Norval White & Elliot Willensky, with Fran Leadon, says the following about 95 Bedford St., "Originally J. Goebel & Company, 95 Bedford St., bet. Barrow and Grove Sts. W. side, 1894, Kurzer & Kohl. Once the end of the century (19th) stable of a wine distributor, as lettering on the façade indicates; converted to apartments in 1927." However, J. Goebel & Co. do not appear to have occupied this building until 1927. And the company was not a wine distributor but dealers in imported clay and crucibles. J. Goebel was Julius Goebel (1844-1917). He was an immigrant from Germany, and appeared in New York city directories beginning in 1868, when his business was located at 166 Grand St. The claim "Established 1865" represents the year Goebel came to New York City. Subsequently, the business was located at 129 Maiden Lane for the 45-year stretch, 1873 to 1918. Julius Goebel died in 1917, and the business was continued by his son, Julius Goebel Jr. (1883-1940). The business continued until 1957. For the last 30 of these years (1927 to 1957) it was located at 95 Bedford St.
New York Songlines has this to say about 95 Bedford St., "The AIA Guide describes this building as being built as stables in 1894, later serving as a winery before becoming apartments in 1927. A neighbor describes this as "hogwash," however, saying that the building was actually built by J. Goebel & Company as a factory for crucibles--containers for holding molten glass. Apparently the basement is still full of them." The New York City Landmarks Preservation Commission's Greenwich Village Historic District Designation Report (1969), Volume 2, pg. 217, describes 95 Bedford St. in these terms, "#95 This narrow four-story brick building, with stone trim at the first story, was designed for Herman Schade by Kurzer § Kohl, architects, and erected in 1894. The triple-arched, first story windows are a reminder that the building was originally a stable; it was converted into apartments and offices in 1927. The brick panels under the windows of the third and fourth floors lend considerable interest. The paneled fascia board with bracketed cornice has a distinctive fan-shaped pediment, reminiscent of the Queen Anne style." The Journal Engineering Record, 14 April 1894, in its Building Intelligence news section, reported, "95 Bedford St, br stables and dwell; cost $14,000; o, Herman Schade." The most likely scenario, then, would seem to be that the building was constructed in 1894 as a stable, then was converted to apartments and offices in 1927, when J. Goebel & Co. moved here. 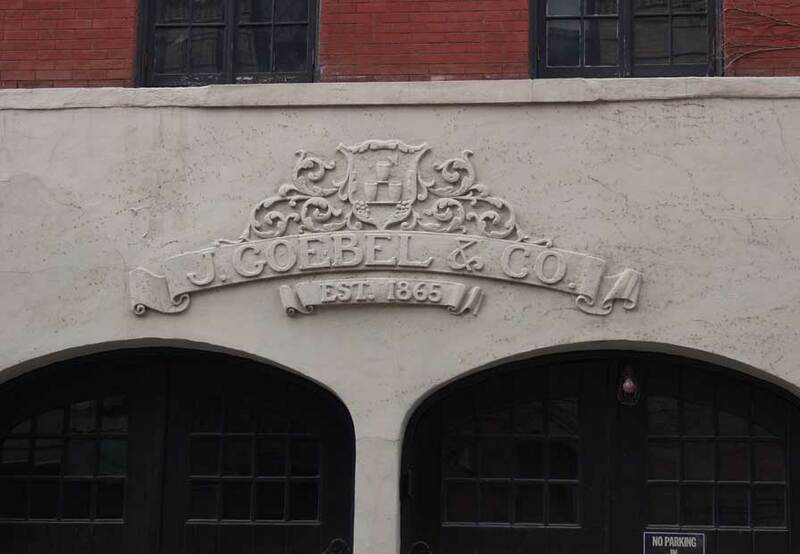 Very likely Goebel did not do manufacturing here, but used their space in the building for offices and storage. An entry on worldcat.org indicates that the Linda Hall Library in Kansas City, Missouri, holds a copy of All about Grossalmerode clay: sold since 1865 by J. Goebel & Co., New York (19--?). Großalmerode, Hesse, Germany is the site of clay pits that yield a type of clay ideally suited to making products with very high resistance to heat. Among such products are crucibles used in glass manufacture. The town of Großalmerode has a Glass and Ceramics Museum, described as follows on http://deutsche-maerchenstrasse.com (as of March 2012), "The Glass and Ceramics Museum offers an impressive exhibition of manufacturing methods and products created from the region's mineral resources. On three floors, interested visitors gain insight into glass blowing history and the various clay processing trades that have given the town its special flair over the last 800 years. The exhibited ceramics range from colourful, lead-glazed crockery to special products such as melting pots, water supply pipes, ointment jars, roof tiles, clay pipes and much more. As early as the 16th century, Großalmerode was widely known beyond the state borders as a centre of glass manufacturing; today, it still enjoys a worldwide reputation for its extraordinarily high-quality heat-resistant ceramic products." This account relating to Goebel is taken from a document dated 1877 available on KYL Ky Digital Library at the University of Kentucky, "On a recent visit to the great International Centennial Exhibition at Philadelphia, the attention of the writer was attracted by an exhibit of this fire-clay, supposed to be one of the most refractory known, and imported for the construction of crucibles to withstand a very high heat, but particularly for our glass manufacturers, who seem to agree that no other known clay will so completely withstand the great heat of their furnaces, and the fluxing influence of the melted glass, as this. It is consequently almost universally used by them as the material for the construction of the glass pots or large crucibles, in which. the glass is made and melted. The exhibit of this clay at the Centennial Exhibition was made by J. Goebel & Co., importers of German clay, and manufacturers of crucibles, &c., Maiden Lane, New York. It showed the clay in its natural and prepared conditions; and accompanying the specimens was a report of the chemical analysis of the material. said to have been made in Germany, a copy of whiclh is appended." During the First World War, J. Goebel & Co. ran this advertisement to insure customers that substituting American clay for their usual German variety would not create an inferior product.